Dunganstown County Wexford: It was from this little farm outside New Ross in Wexford that arguably the most famous Irish emigrant to ever hit America’s shores came from. Patrick Kennedy was a cooper, or barrel maker when he departed this land in 1847 fleeing famine or chasing his true love Bridget Murphy, depending on who you believe. The access roads to and from the farm don’t look all that different from the day he left I’d say. The narrow path, barely room for one car, is paved over now of course, but the sense of rural Ireland and a far more simple era is evident. In New Ross harbor he climbed on board and ship and set sail for America. 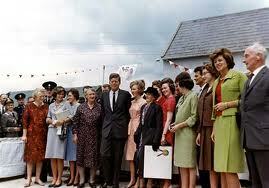 John F. Kennedy would come back to visit Dunganstown in 1963. Today, Patrick Grennan, Patrick Kennedy’s descendant farms the land where he left from and gives visitors a wonderful tour of the old homestead. You are standing in history’s road here, as you are in nearby New Ross where the exodus to America began. In the harbor now is the Dunbrody, a perfect replica of a Famine ship such as the one that Patrick boarded all those years ago. I am in Wexford to accompany another famous great grandson of an Irish emigrant from the period. When Michael Keough left from here around the same time as Patrick Kennedy he could hardly have envisaged that his descendant Donald Keough would one day return as president of Coca Cola, the best known corporation in the world. Now retired but till on the board of Coke, It was a deeply moving experience for Don Keough to clamber on board the Dunbrody yesterday and relive what Michael went through. Actors dressed as emigrants at the time laid bare the stark facts of life on the boat. On many trips up to half of the 250 or so passengers died. It is easy to see why. Sanitation was primitive. In bad weather the hatches were bolted down and the passengers were unable to get on deck. The voyage took four weeks, time for cholera and other illnesses to become rampant. As Don Keough remarked, we can’t imagine what they went through to reach the Bright City of America. It was an intensely important moment for him to stand where his ancestor stood, anticipating the new world, that awaited him after the ship reached the neck of the Barrow river and launched on the broad Atlantic en route to America. Don Keough came back and gave back. His company has invested over $900 million to date in Ireland, including one plant that is being officially opened today in Wexford town, which is nearby and which will eventually supply 100 badly needed jobs. One can only imagine the joy that Michael Keough would feel in what his great grandson has accomplished. Part of the Dunbrody footprint now includes the Irish America Hall of Fame, which Keough was inducted into last year. It is a wonderful exhibit, tying the incredible rich history of the Irish in America to the port where so many including Kennedy, Keough and Eugene O’Neill’s people left from. Wexford was also where the English first landed in Ireland and where the famous rebellion of 1798 began and ended. On a beautiful autumn day in Ireland the county looked resplendent in the warm sunlight. The shades of its great and often tragic history loom everywhere though. For Don Keough, as it was for John F. Kennedy, it was a wonderful and warm homecoming though.